I honestly didn’t believe my Ortho when she said it would take at least 6 months to be active again post ATR. It’s been 4.5 and she wasn’t far off. After 4 weeks in a cast, 6 in a walking boot and 10 total weeks of PT, the past 3 weeks have been much better and except for early morning and evening, I can take normal strides. Running, or at least jogging, is the next step. I saw the Ortho for the last time on the 17th and she gave me the option for another 4 weeks of optional PT, mainly for agility and because I told her the day after my ATR that I want to be able to do everything I was able to before the injury. 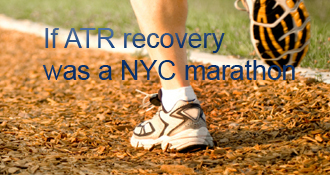 If you’re out there and just suffered an ATR, keep your head up. It can be a long road to recovery. However, listen to what your Ortho recommends and then work hard with your PT’s. They’re the ones I give most credit to for my recovery and would highly recommend them. Doc recommended PT to start next week. My AT is so sore after a month in the cast, but the boot is great because I can remove it to shower. Can barely put any weight on my left leg in the boot, but looking forward to PT at least for a few sessions. ROM is very limited, but already feels better one day out of the cast. Well, five weeks post surgery, four weeks in a cast and I’m ready for a walking boot. I’m thankful for crutches but will be happy to let them go. The lingering question on my mind is how long till I’m FWB? My surgeon does not elaborate on much and just wants me out of her office at $230 a visit. Is this common with specialists? Some tell me it’s par for the course. How much I’ve taken for granted with sports and mobility! My ignorance of tendinosis and too much, too soon activity playing basketball have led me here. I’m thankful to be in recovery and pray that I can help others either avoid this ATR injury or help with their recovery. Good submit. I just desired to level out that this is among the most effective deals within the internet. Quite good. Nice publish. I just wanted to level out that this is one of the finest deals within the net. Really nice. Wow. That IS a long time…especially looking at it from week one. Glad that you are doing well and sounds like you are just about there. Great! Go back to the people who gave you the wrong ones, or go to somebody else. E.g., every ski shop in the world carries the right kind, and I doubt you’d pay $10 for a nice set of them — especially after you tell them your story!! The main problem is that my tendon will not flex far enough to where I can stand flat on my foot. The angle of my ankle/foot was at -45 degrees for a month in the cast. This walking boot is almost at 90 degrees minus the four “cushions” in the heel which do little to prop my foot. Therefore, until I get more ROM in my foot/tendon, it’s not able to support more than partial weight. PT is helping a lot, but very painful. Who said anything about the wound weeping? And I’m with Norm, I don’t understand what hurts. I had some tenderness in the heel of my injured foot when I went from NWB to PWB, but that went away in just a few days. Sometimes people confuse the pain originating from the stitches or wound stretching rather than the achilles itself. Movement upwards from plantar to dorsiflex and stretch the repairing would - causing it to weep. So your foot is at a less obtuse angle now than it was in the casts? If the upper part of your boot is snug to your upper calf, and the sole of your foot isn’t tender, I still don’t understand what hurts, or what is uncomfortable, when you shift weight to that foot. There should be virtually no strain on your ankle and AT, unless I’m missing (or forgetting) something. The “I’m obviously not ready to stand on my toes” confuses me. Walking in an orthotic boot with heel lifts is nothing like standing on your toes, though it’s a bit like walking in shoes with (high) heels, except that you’ve got the shank of the boot nailed to your upper calf to do the job of your AT and ankle. If your other shoe doesn’t match, it’s way awkward, but the solution is to adapt your other shoe to match. I can put some weight on my foot, however the month it was in the cast, my foot was at an obtuse angle rather than a 90 degree, the way my OS set it. Now my foot still points down but ROM is already improving. Therefore, I’m obviously not ready to stand on my toes. As for PT, I’m going to try this one and see how they’re doing. Six weeks is the recommendation from my doc, but I may shop around if needed (i.e. perhaps someone better suited to endurance sports). What keeps you from putting more than “barely any” weight on your foot, in the boot? If it’s soreness at the bottom of your foot (esp. heel), “welcome to the club”. Squishy insoles inside the boot help, but then you have to raise up your other foot even higher to stay aligned. I don’t think anything else SHOULD bother you about weight-bearing in the boot, or even walking in the boot, once your foot gets used to the weight. When that happens, the boot should give you enough support that you can walk (”clomp”?) at full speed, striking the heel then rolling straight forward over the toe. It’s almost like normal walking, except that your shin (and the top of the boot) bear the load that your AT would normally take, and there’s no “push-off” at the end of the stride. Fortunately, I think, I was never in a cast. I got a boot, the black Donjoy monstrosity, the day I ruptured and that was all I ever had. But, I did go into a cast after my fourth surgery, which was just to remove the internal sutures that had caused an abscess. I only had it on for a week and was free to walk in it. Maybe I was lucky but I actually found it more comfortable at night than the boot was, but the boot was definitely better for walking. At five weeks post-op, you should be able to put a fair amount of weight on your bad foot. What I, and others, have found helpful is to make sure your bad foot stays in front on your good foot for a while and make sure any weight is transmitted through your heel. It feels odd but I only used this around the house and relied on my crutches if I had to go very far. Until I got to the point where I could actually flex my ankle some. Also, it is really important to wear a shoe that puts the soles of both feet the same or nearly the same distance off the floor. You can give yourself back and hip problems otherwise. About your doctor - this’s just my opinion, but it looks like applies to almost 99% of us simple (no stars) people - you get doc attention at initial visit and surgery and the next post OP visit and that’s all. You might not get anything concrete after those visits and not many Docs even know in details recovery protocols - they rule based on 6 or even 12 months recovery time. They outsource you to PT for recovery protocol. And as many mentioned it’s already - PT is much more important in post OP / cast than Doc. As my Doc honestly told me - ” if about surgery it’s me, but if about recovery or tendon and etc than it’s PT, who has far more info for that matter. My point is don’t even try to extract much info from Doc, but concentrate on PT. I started massaging with fingers and lube with great results initially. The remaining central area of adhesion is smaller and much tougher than the original periphery. Lately I’ve been using the cap of a Sharpie pen with lube to press hard and manipulate the dime sized area, a bit painful and progress has slowed, but I’m guessing better than waiting for Docs instructions. Moving in all directions is supposed to be important. It helps that sweetie is a massage therapist but I don’t let her touch it. Look up the “Graston Technique” to see where I got the idea. I think someone here suggested the handle of a butter knife as well. I almost ordered a hinged boot on my own but I think I’ll be out of the boot altogether pretty soon. I walk around the house barefoot but put the boot back on if I’m doing anything that takes concentration off walking. I would say FWB as tolerated as soon as you get into a boot. If you have a chance look up the VacoCast. It’s far superior to anything I’ve seen and well worth the extra cost. Order it yourself or get your doc to give it to you at cost since you recommended it. Very easy to walk in at 90 with a small lift in other shoe. It sounds like you’ve got one of the subpar docs who either doesn’t know or care about rehab. My advice would be to find a PT who will buy into Norm’s protocol and fire away. BTW, you don’t have to go see the doc every time he/she says to come back. I’ve cancelled several appointments since PT started. Just not necessary - there’ s nothing the doc could do. We’re going to have one final powwow in a couple weeks, doc, PT and me, to review the experience and maybe even write it up. As for prevention, I’m guessing that, given the abuse I subjected my AT’s to over the years, the only prevention would have been abstinence! How do you do this “massage adhesions” / deep tissue massage to remove scar tissue? 3 to 4 weeks to walking boot sounds about right but everyone progresses at their own rate. Any longer sounds suspect unless you have a difficult case. I am 5 weeks post-op, ruptured water skiing, open surgery, haven’t started a blog but have read a lot of good info here and got leads on plenty more as well. The research has given me the confidence to start rehab and PT on my own. My doc has not exactly been open discussing “the future” and prefers to proceed slowly and take one step at a time. I can’t blame him but it’s my foot! +1 to everything Gerryr said. The protocol a few of us have been following here, which produced excellent results in a recent study with BOTH surgical AND non-surgical patients, calls for “protected weight-bearing” (in a boot) at TWO weeks, progressing to WBAT (full WB “as tolerated”) at FOUR weeks. Before 5 weeks in, I was forgetting where I’d put the cane that replaced the crutches — i.e., FWB. There are protocols that call for much FASTER FWB than that, mostly tested after surgery, and mostly showing benefits (and none showing disbenefits, AFAIK). Several are linked from the main page here, in the “studies” link. One metastudy showed the benefits of a “functional orthosis”, i.e., a HINGED boot, which is what I recommend. Blogger “gunner” here is one of several who have tried the new VacoCast or VacoPed hinged boot, and gunner and almost all the other users recommend it highly. First of all, it is the duty of your surgeon to fully answer your questions. Ask for a detailed plan and don’t settle for less than that. They are not doing this for free. You have every right to ask for a full explanation and it’s their duty as a doctor to explain fully. I didn’t ask enough questions nor did I do any research immediately after my ATR and prior to going under the knife for the first time. By the time I got to the fourth time I was damn welled prepared and in the process fired on surgeon who wasn’t being honest with me about his intentions. That said, if you are going into a walking boot, will you still be using crutches? If not, then you will be FWB. marathonman’s AchillesBlog is proudly powered by WordPress and WPDesigner..